Tuesday started the second term of the School of Christian Living, so the catering continues for at least another 6 weeks! Yay! I’m enjoying it way more than I ever thought I would! This week was really hard to find something I was inspired to make. After much discussion with Mom, and looking through all of the magazine cutouts we’ve collected, I decided on Ratatouille Soup, Kalamata Olive & Sun Dried Tomato Muffins with a Goat Cheese Center, Salad, and Peanut Butter Chocolate Chip Cookies. Heat the olive oil in a large pot over medium-high heat. Add the onion and the smashed garlic and cook until soft, about 3 minutes. 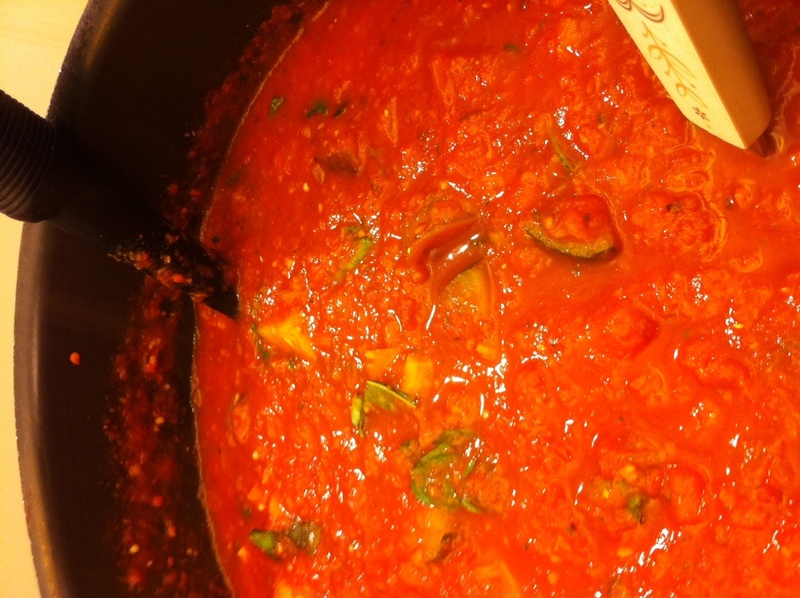 Add the eggplant, zucchini, and bell peppers; cook for about 5 minutes. Add the tomatoes, broth, herbes, cumin, honey, and half the basil. Bring soup to a boil, then reduce heat and simmer for 30 minutes. I’d definitely recommend serving this with some parmesan cheese on top…sadly I forgot to bring some (nor did I have any money left in my budget) for Tuesday night. So the great debate on Tuesday was about calorie counts. Based on some feedback from last term of SCL, I’m calculating the calorie counts. I went ahead and put the count on the labels I make for the buffet line. At dinner I overheard one table discussing how they didn’t want to know the numbers. I think in the future I’ll have the nutrition facts available on a side table but not written on the food labels. What are your thoughts? If the knowledge is available would you want to know?